Made from some leftovers in my stash. 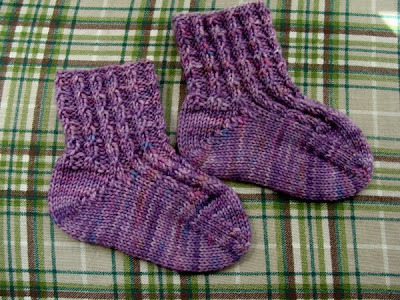 Pattern: Better-Than-Booties Baby Socks by Ann Budd. Needles: Size 2 Addi Turbo circulars. Comments and Changes: They came out a little larger than expected, but that’s cos I used size 2 needles rather than size 0. The method for the short rowed heel is very interesting. I like how it turns out. I did some changes to the pattern. First of all, I put cables over the whole instep, rather than just two on the sides. Second, I didn’t like the way the pattern does the toes, so I just did a regular traditional sock toe. oh so cute! Just downloaded the pattern as my neighbour is expecting.